Plot: In 1944 fascist Spain, a girl, fascinated with fairy-tales, is sent along with her pregnant mother to live with her new stepfather, a ruthless captain of the Spanish army. 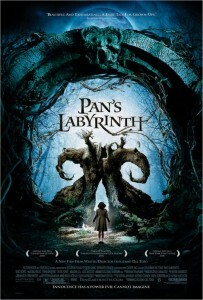 During the night, she meets a fairy who takes her to an old faun in the center of the labyrinth. He tells her she’s a princess, but must prove her royalty by surviving three gruesome tasks. This entry was posted in P. Bookmark the permalink.